The UK budget accommodation chain is planning dozens more facilities in the capital. PREMIER INN HAS revealed plans to open its first Dublin city-centre hotel in a long-vacant site on George’s Street. Dublin council previously gave the all-clear for the development of a new 100-room hotel in the building that formerly housed the Dockrell’s hardware store. In the planning application, submitted by Grosam Properties Limited, it was noted that a hotel operator had already agreed to occupy the development. Following the successful application, the owner of the Premier Inn hotel chain, Whitbread, has revealed its intention to open a new 97-bedroom hotel in the spot located on the corner of Stephen’s Street. The new hotel will be Premier Inn’s first site in Dublin city centre. The hotel brand only has one other hotel open in Ireland, a 213-bedroom complex near Dublin Airport. Whitbread said the new hotel would include Premier Inn’s in-house Thyme restaurant and it was expected the new development would be open by summer 2021. Whitbread head of acquisitions in Ireland Kevin Murray said that this is the start of the UK hotel chain’s “acquisition drive” across Ireland. “(We) are pursuing live leasehold and freehold opportunities, including potential office-to-hotel conversions, as well as going concern purchases,” he said. A statement released by the company outlined its plans to grow its Dublin portfolio to between 1,500 to 2,000 bedrooms. JLL Hotels Ireland senior vice president Daniel O’Connor, who advised Whitbread on its expansion in Ireland, said the Dublin market is a prime expansion city for budget hotel operators at the moment. “Dublin is experiencing considerable demand for hotel accommodation against a historic undersupply of bedrooms, particularly in the ‘branded budget’ hotel sector,” he said. According to Property Week, the company has plans to open up to 15 hotels in the Irish capital before it expands into other cities like Limerick, Galway and Cork. Whitbread will mainly focus on the development of 100- to 250-bed hotels in locations such as Dublin’s docklands, the area around O’Connell Street and other city-centre locations. The move into Ireland is part of the group’s international expansion plans. Premier Inn has already launched its first hotel in Germany and plans to open another 19 in the mainland European country. The trends in the Irish hotel market highlighted by JLL Hotels Ireland are backed up by figures released by hospitality analytics firm STR Global. Recent data published by firm showed that the demand for rooms in Dublin has pushed hotel prices up to record levels in Dublin. This trend has prompted a number of new entrants to the hotel market, including EasyHotel and Motel One, and a general spike in the development of new tourist accommodation blocks. According to a recent Fáilte Ireland report, a total of 5,436 hotel rooms will be built in the Irish capital between 2018 and 2020. 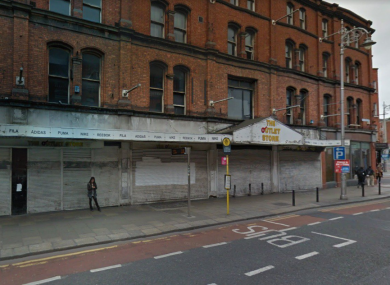 Email “Premier Inn is opening its first Dublin city-centre hotel in this long-vacant George's Street building”. Feedback on “Premier Inn is opening its first Dublin city-centre hotel in this long-vacant George's Street building”.